If you’re seeking a mythical world of dragons, castles, giants, and wildlings, look beyond your imagination and make your way to Spain. There’s something about Spain that conjures up fantasy and intrigue. That’s why the masterminds behind HBO’s Game of Thrones chose Spain as a filming location when creating the show’s mythical, magical world. Spain’s dramatic and varied landscapes have an air of mystery, and its ancient castles invite an entire cast of royalty into the imagination. With a long list of stunning locations to choose from, diehard fans of the show can binge on Game of Thrones inspired adventures at one of these real-life filming locations in Spain. Oh, and keep your eyes peeled for dragons. Castil de tierra, Las Bardenas, Soria, Spain. We’ll start in the north of Spain, where you can spark your imagination with visions of Khal Drogo. 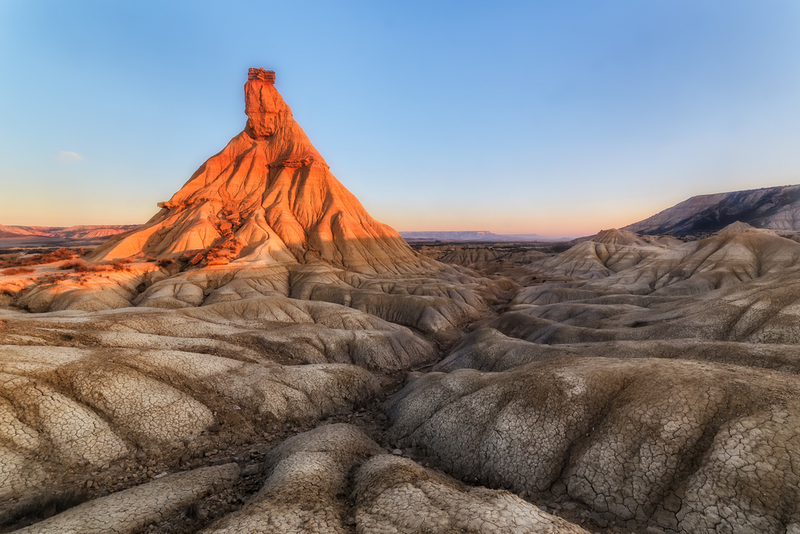 Make your way to Navarre to explore the Bardenas Reales. This semi-desert region in Spain has an almost lunar landscape, and it was used to film parts of the Dothraki sea, home to the horseback Khalasar warriors in Game of Thrones. Known as the Spanish badlands, this 100,000-acre Natural Park is made up primarily of clay, chalk, and sandstone. This is one of the few deserts in Europe, and it is definitely the most striking! You may not think of a desert as a place of fantasy, but this one is different. Thanks to centuries of erosion from both water and wind, the badlands boast surprising and impressive shapes, canyons, and plateaus. Get out of your car and explore these unique geological formations on foot — there are plenty of hiking and biking trails throughout the park. While you won’t find any dragons here, you may see a golden eagle (or a golden vulture, which just doesn’t sound as impressive). The Bardenas Reales is also home to a bombing range used by the Spanish Air Force. Again, no dragons overhead, but you may see a fighter jet zoom on by. Just squint your eyes and pretend. This Moorish palace is an unbelievable feast for the eyes; it’s no wonder that Game of Thrones chose this unique palace as the royal Martell family’s summer home in Dorne. But whether you’re a fan of Game of Thrones or just a seeker of awe-inspiring architecture and landscaping, do not miss the Real Alcázar in Seville when you visit Spain. Named as a UNESCO World Heritage site in 1987, the Alcazar is the crown jewel of Spain’s palaces. It’s hard to give an exact age to this sprawling palace because different rulers made their own additions and changes — parts of it were constructed as early as the 10th century, but it’s final buildings and reconstructions happened in the 1300s. This assortment of rulers culminated in an odd but fascinating blend of Arab and Christian influences, from the architecture to the artwork. And the royal family still uses the upper levels of the Alcázar as their official residence when visiting Seville, making it the oldest royal palace still in use in all of Europe. If you’re lucky, you may rub shoulders with actual royalty, not just the fictional kind. It’s hard to name just one must-see sight at the Alcázar. Las Doncellas Courtyard, with its long, shallow pond, gorgeous tiled promenade, and intricate Moorish arches is definitely on the list. Then, escape underground to the Los Baños de Doña Maria de Padilla — these giant rainwater tanks beneath the castle once served as baths but now serve as yet another Instagram-worthy location in the Alcázar. An altogether different adventure awaits you outside the palace in the royal gardens. Get lost for an entire day as you roam through lush landscaping, alluring fountains, and hidden statues. The Fountain of Neptune is a prime location for gazing out upon your subjects as a member of the House Martell. Gaztelugatxe Island, Biscay, Basque Country, Spain. There be dragons in northern Basque Country. Well, maybe not, but this is the region in Spain where Game of Thrones filmed the scenes for the mystical island of Dragonstone. Gaztelugatxe (“castle rock”) is the islet where Daenerys, the Mother of Dragons, had her castle perched high on a cliff. With its winding footbridge and dramatic sea views, Game of Thrones fans are sure to recognize this unforgettable location in Spain. The islet of Gaztelugatxe is connected to the mainland by a zig-zagged, man- made footbridge and 241 stone steps. The bridge alone is a sight to behold! But don’t forget to take in your surroundings — look all around you at the 60-million-year-old natural wonders that make up the Bay of Biscay and this section of the Spanish coastline. You won’t find Daenerys’ castle at the end of the long, winding path. The islet is actually home to a small church believed to originally have been built over a thousand years ago. Legend has it that St. John the Baptist himself set foot here, so it’s considered a place of good luck. Follow the ancient tradition and ring the bell three times: then, make a wish. 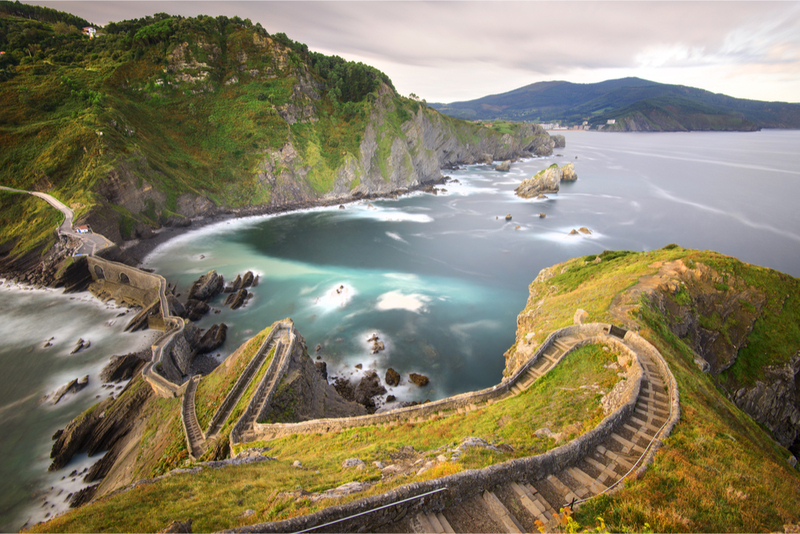 The Basque Country’s spectacular, rocky coastline was used as a location for several scenes from Game of Thrones. With protruding rock formations and crashing waves, this stretch of the coast beckons adventure. So, wander if you dare.